You must be wondering what day-to-day life with a loony is like. How can it be so time-consuming, when all she does is lie in bed all day? I realise such a rapid change of direction doesn’t fool you for a mo. Yesterday we were in the Florence Nightingale Unit and late 2001. What happened to that nail-biting, white-knuckle-ride, cliff--slide-on-our-bottoms-down-to-the-beach I left you with, eh? Yes, well. I’ll come back to it tomorrow. Having lived through several of Shaun’s breakdowns, I’ve become much more attuned to, and respectful of, my own feeble squawks of emotional protest. I’ve learnt to be kind to myself. I need a break from being cross today. Given that you’re all gluttons for punishment and longing to go back in there, we’ll return to the Flo Nightingale tomorrow. So, back to living with someone who’s round the bend and why it’s hard to do anything much else at the same time. Obviously, you have to feed her occasionally. And she can’t do anything to help with that process. No, really, she can’t. The last time but three that Shaun and I accompanied Bink to her umpteenth tribunal to fight for her disability benefits yet again, the panel of judges asked us to comment on her assertion that she wasn’t “safe in a kitchen.” The look of instant stricken terror on our faces and the way we glanced nervously around, like Pavlov’s dogs, for the nearest fire extinguisher was enough to obviate the need for words. So she grabbed a plastic bag. And, yes, used it. When she was in the Bethlem Hospital, they told her that cooking was an essential aspect of every patient’s OT. “I’m not sure you want me in your kitchen,” she warned them. After one session – one session – Bink was excused cooking. For all time. They put her on house demolition instead. Anyway, you’re partially right. A lot of the time, now I’ve given up on believing I can ever help her get well myself, I leave Bink alone under the covers upstairs. It’s pretty depressing, knowing there’s a Mrs Rochester in the attic, but you get used to it. Like you get used to hitting your head repeatedly with a claw hammer. Much of the time, though, she needs something. The other day she was up earlier than usual. About 4pm. Looking drawn and distressed. Dryers? Bink hasn’t been able to use our laundry for two and a half years, when she disappeared for three months after thirteen-year-old Rose changed the programme on her wash, mid-cycle, to a shorter one so her uniform would be ready for the start of term that day. Bink went into melt-down about her beloved baby sister spending all term contaminated by soap residue. My fault, somehow. Most things are. That was at the New Year. Bink was still living elsewhere and unable to join us for the joyous week-long celebration of Rose’s confirmation, at Easter. Yet again, family incomplete. Anyway, I deliberately have a dryer in the laundry which barely works, so everyone is forced to use sun and air. We live next door to a care home for the acutely disabled. We hear the occasional bloodcurdling screech in the night, but we don’t mind that: we are grateful to them for doing such loving work on behalf of society. What Bink and I mind are the sound of the dryers going night and day. To be fair, most of the time no one else can hear them (except, intriguingly, my 100-year-old father) and the owners of the home are trying everything they can to muffle them. 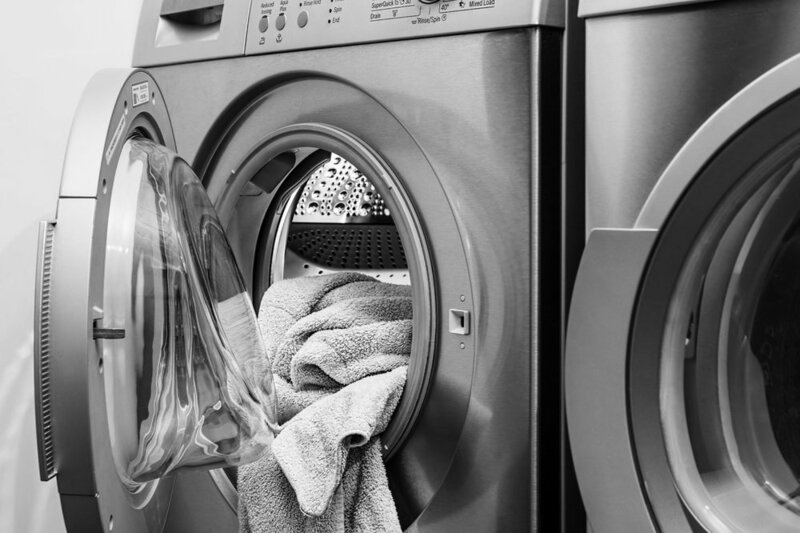 But I have an utter loathing of mechanical noise, however almost-imperceptible, and wouldn’t have chosen our house if the dryers had already been in place. I couldn’t live (voluntarily) within several miles of a distant motorway. I won’t say, it drives me nuts. I just hate it. She can’t sleep. She can’t get out of bed. She can’t start a shower. That kind of nuts. Sometimes she can cope with it for a few weeks, if the wind is blowing the right direction. Sometimes she can’t. This was one of those. She couldn’t stand one more minute of it. I could tell, by the ghostly pallor on her face and the shaking limbs. Trouble is, when you’ve been trying to solve a problem for several years, there’s a limit to how much you can do in an afternoon. Still, she begged me to go round there, though the owner is seldom available. She came with me, in her huge men’s boxers, baggy teeshirt and nothing else. And we spent the next couple of hours, with the kind and solicitous proprietor, turning the machines on and off; going up to Bink’s room and coming back again; eventually with my lugging the heavy old wooden ping-pong table we use to serve dinner to paying guests in the garden, and laying it over the exit pipes of the dryers, probably in contravention of every fire reg you’ve ever imagined; going back up to her room; finding it didn’t make the slightest difference; finally my agreeing to source an acoustics expert and the proprietor agreeing (yet again) to source quieter industrial drying machines, if they exist, next time they upgrade. No difference in the sound whatsoever. But a difference in Bink. This is why my novel coming out next month is my first for nearly twenty years. That is what I've spent my days doing for all that time. While most people are being productive at work.